This assessment reviews the occurrence of smoke and air quality information within 91courses and 125 PTBs. 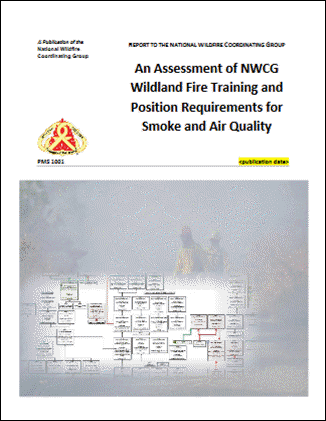 Smoke management context, detail, and conformity of position requirements among agencies are assessed. Of the 91 NWCG courses assessed for key words and information, 70 contained relevant key words. Of those, 19 courses contained at least 50% or more hits relevant to “smoke management and air quality”, but only 2 courses contained content that enabled a working knowledge of smoke management and air quality principles. These two courses were 'Smoke Management Techniques' and 'Prescribed Fire Plan Preparation'. Of these, FOBS has fairly light smoke management responsibilities, and low requirements for smoke management background. FEMOs may also come into the position with a relatively little smoke management background, as do LTANs. The position of SOPL has multiple routes by which it may be entered, some requiring more smoke management background than others. NWCG does not require smoke management training for SOPL; however it may be present for personnel in the position who arrived via a USFS Fire Use Manager or Prescribed Burn Boss position. Personnel arriving to this position via similar routes in other agencies, or via the Division Section chief may not have the same level of smoke management background, as RX-410 is not a requirement for those routes. As with SOPL, prescribed burn bosses and managers may have various levels of smoke management knowledge based on their home agency and the route through which they arrived at their current position. For example, in the case of burn bosses, NWCG does not require RX-410 for these positions, while the Forest Service does. 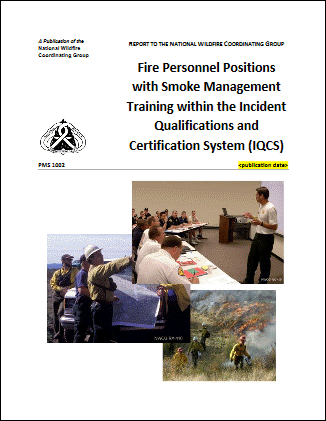 A query of the Incident Command Qualification System to determine what positions currently have RX-410 and RX-341, will follow this report to provide finer detail into where smoke management education is dispersed throughout the current command structure. There are multiple levels of smoke responsibility, where different positions require less detail, or different knowledge, than is currently conveyed in RX-341 or RX-410. For example, LTANs have smoke monitoring requirements, yet there is little smoke monitoring training in the courses. PIOs often need smoke messaging information to relay to the public but do not receive training in this area. Many wildfire positions have smoke management training likely acquired by their previous or current involvement in prescribed fire and fuels programs indicating a dependence of the wildfire incident management teams on the prescribed fire and fuels programs. Smoke from wildfires is an example where direct coordination with partners, stakeholders, and the public is needed in wildfire decisions, something that is directed in two NWCG reports; Report on Evolving Incident Management: A Recommendation for the Future (NWCG 2011) and the Guidance for Implementation of Federal Wildland Fire Management Policy (Fire Executive Council 2009). Smoke impacts can be costly and recent studies have correlated wildfire smoke impacts with dramatic increases in medical costs and mortality. Furthermore, transportation fatalities have been attributed to wildfire smoke. Currently, no training addresses this. While it appears that smoke management training is permeating many prescribed fire and suppression positions, some key positions (such as PIOs) have very little smoke training and other positions may not be getting the type of smoke training they need (such as LTANS). Finally, recent wildfire smoke impact situations clearly indicate the need for additional training. The goal of this project is to identify current smoke training needs and to inform discussions about the future direction of NWCG smoke training and knowledge base.